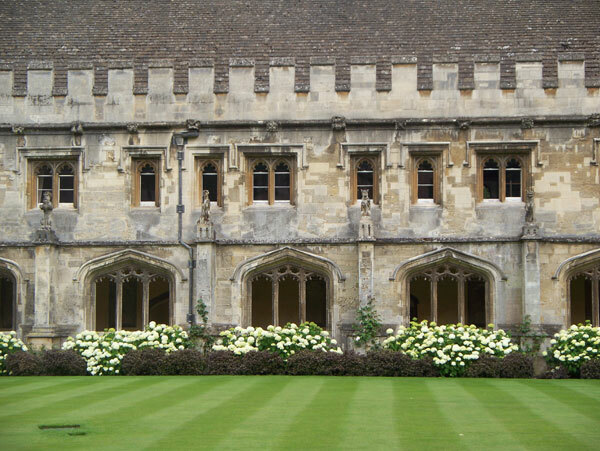 Magdalen College (impress your friends by explaining that it’s pronounced ‘maudlin’) was founded in 1458, and the present buildings were erected at various dates between then and the 21st century. 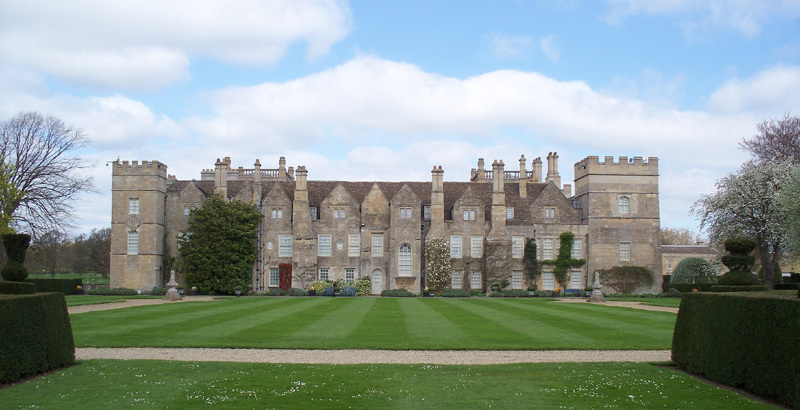 The college has been visited by kings and princes, and has had famous students including Edward VIII (when Prince of Wales). 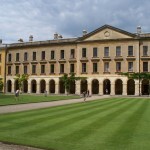 20th century fellows include the English scholar and theologian C. S. Lewis and the historian A. J. P. Taylor. 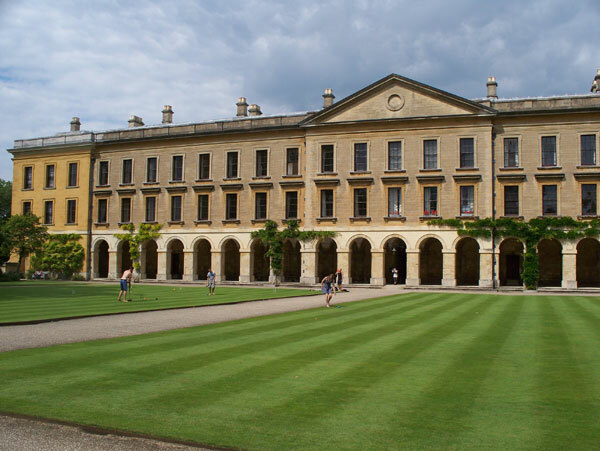 Today the College has a large number of students, many living in the historic rooms on the campus, and an endowment of around £170 million. 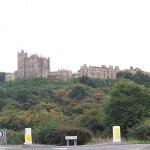 Visitors are welcomed at certain times (entrance charges payable) and allowed to wander around the public areas (not the student areas) and admire the historic buildings. 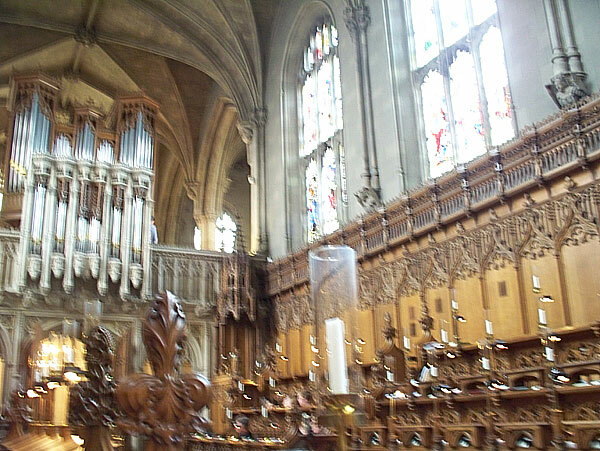 The Chapel and Choir are famous, and the Chapel, with its largely 19th century interior, is very impressive. 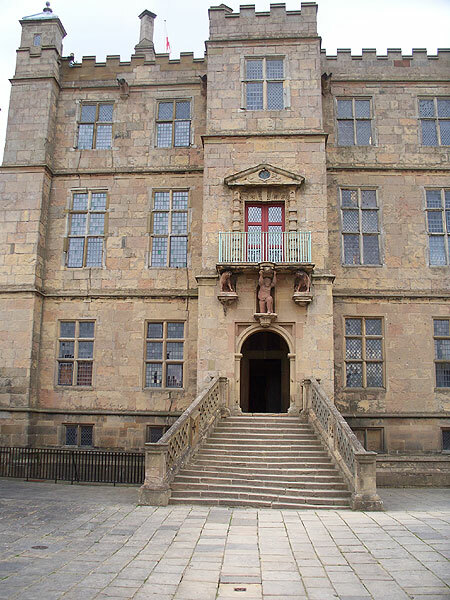 The Hall is also worth seeing, as are the quad with the cloister and gargoyles, and the exteriors of other buildings. The guidebook supplied isn’t very good as it does not have a map or pictures to help you figure out what you are supposed to be looking at. (Clue: it starts to your extreme right on entering the first open space). Best bring your own. 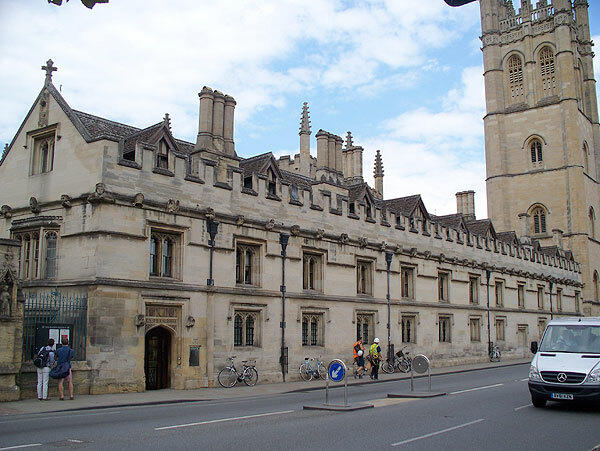 Car parking in the area is very limited, so I advise using the Oxford Park & Ride instead. 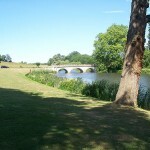 The Botanical Gardens are across the road, and there are other colleges nearby whose quads can be visited, and river walks. 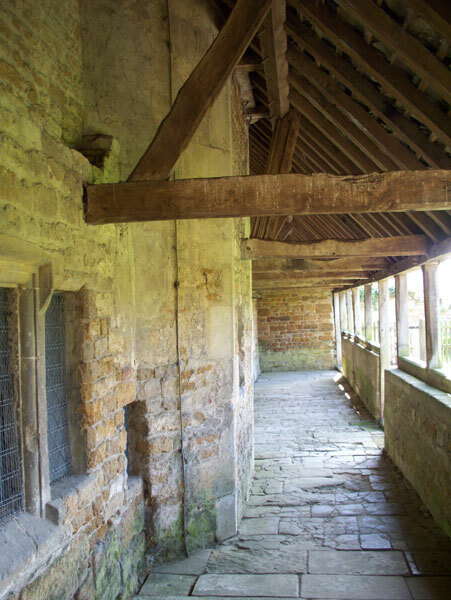 The Bede House is the surviving wing of a medieval palace built for the Bishops of Lincoln. 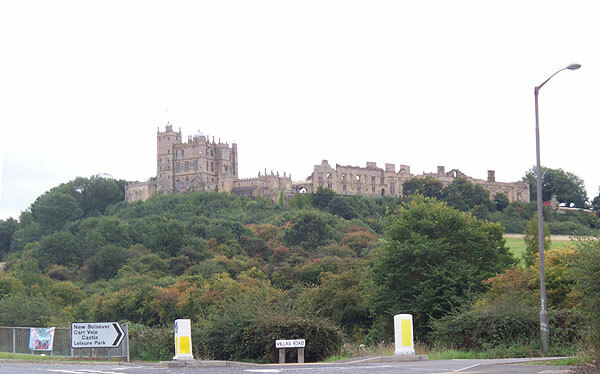 After the dissolution of the monasteries, the palace was passed to one of Henry VIII’s supporters. 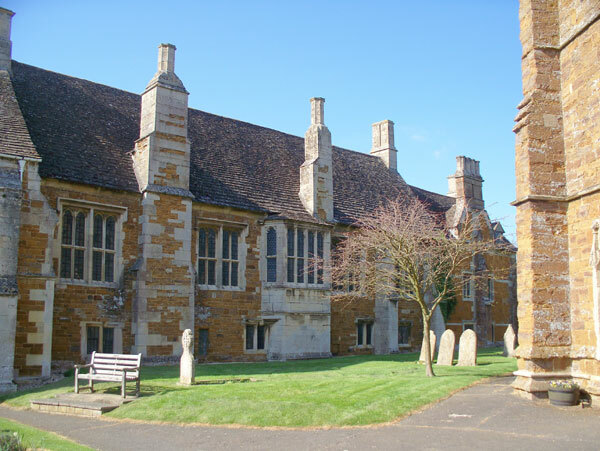 In 1600 the structure was converted to almshouses for pensioners or ‘bedesmen’, and later remodelling produced the current structure with the addition of chimneys, fireplaces, and subdivisions to provide 12 small ground-floor rooms. 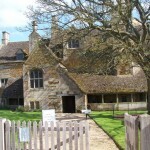 The Bede House is next to the church and churchyard, which seem to have been built later. 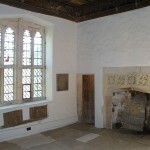 The building, on three floors, is of great interest, and contains on the first floor a very fine Great Chamber, later the common hall of the Bede House. 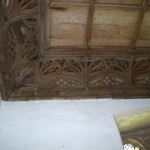 The chamber retains its ornate wooden ceiling and sumptuously carved wooden cornice. 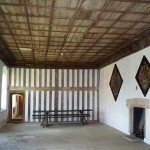 The adjoining Presence Chamber has a similar ceiling. 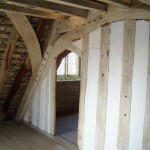 A room near the stairs is fitted out as it would have been when last occupied. On reaching the end of the sat-nav directions, you need to park in the village street and proceed on foot. The EH pay desk is inside on the ground floor. 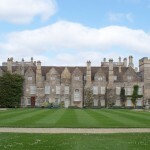 The EH guidebook contains floor plans and much historical information. 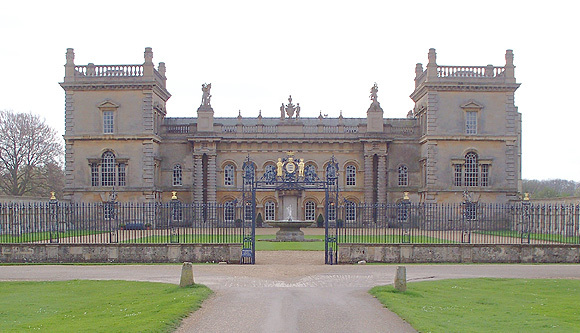 Grimsthorpe Castle is a large country house in rural Lincolnshire, set in a 3000 acre park. 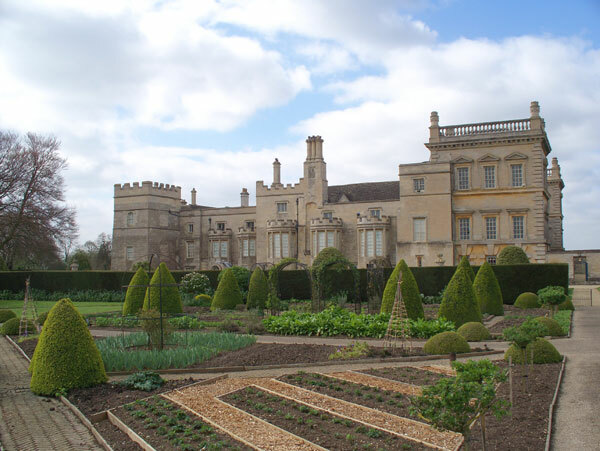 Since 1516, Grimsthorpe has been owned by the holders of the Norman title, the Barony of Willoughby de Eresby. 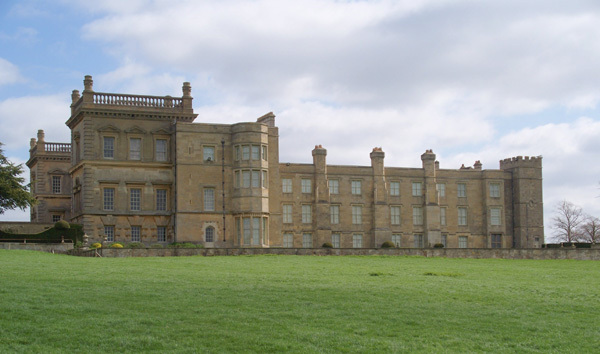 Approaching the house along the drive, one sees the imposing North Front. 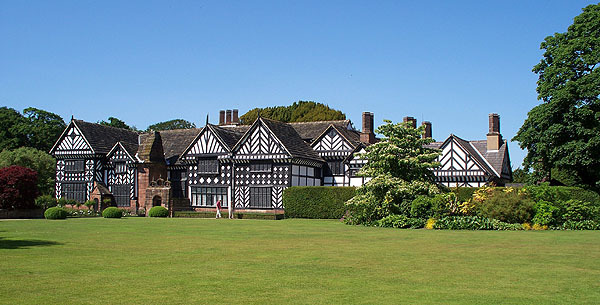 Closer to, the East and West wings of a large square building are in a different style, while the South front, a Tudor-style jumble of gables, might be a totally different building. 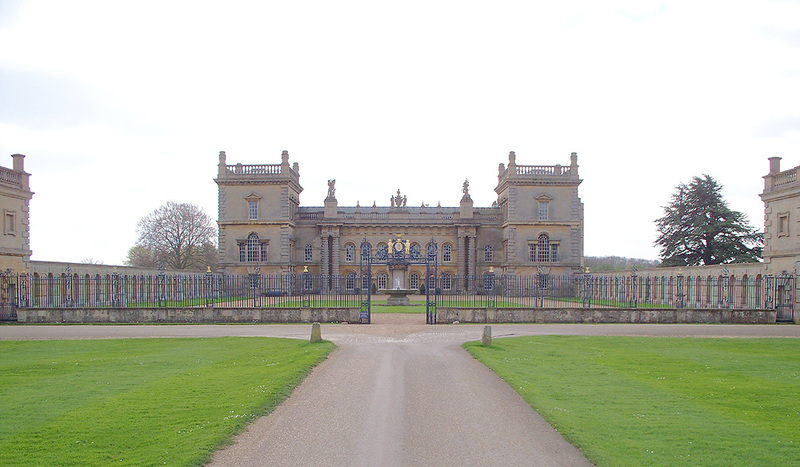 The house was constructed in a number of phases. 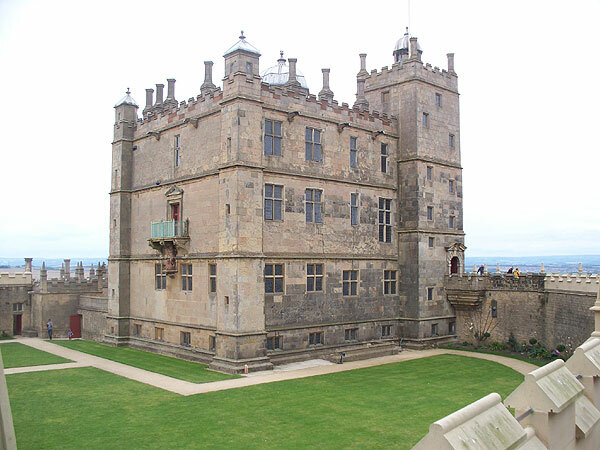 First there was a small castellated tower, which survives as King John’s Tower in the south-east corner. 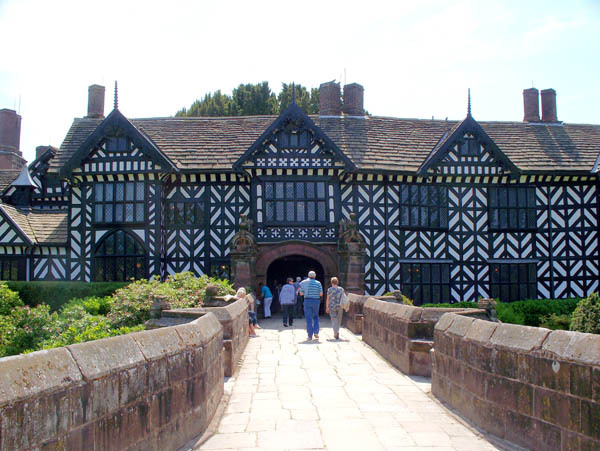 Then a Tudor house was attached to this, and later hastily extended to a Tudor house of four wings around a central courtyard. 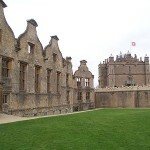 The Tudor North front was replaced by a newer one, which did not last long before it disappeared and was replaced by Vanburgh’s imposing North Front, which work extends as a skin about one-third of the way along the east and West sides. 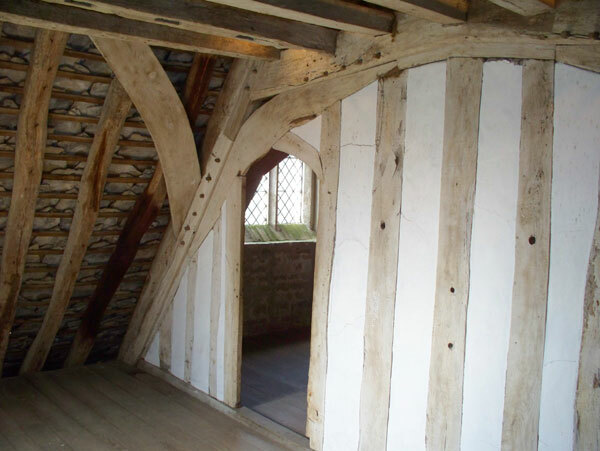 The last major change was to raise and re-skin the surviving Tudor East and West wings. 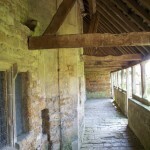 Inside, after entering the base of the left-hand front tower, one passes through a low vaulted hall before reaching one of a pair of staircases flanking the great hall, and getting a glimpse of the hall itself. 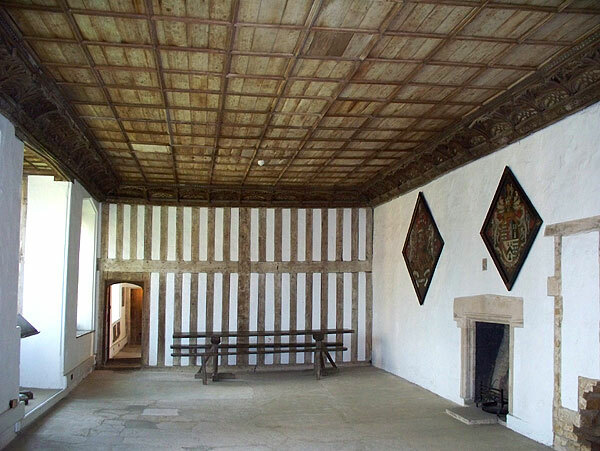 Upstairs, one is directed into the State Dining Room, at first floor level in the tower, then southwards through the King James Room, State Drawing Room, and Tapestry Room in the east wing. 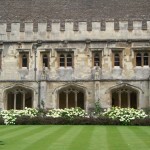 After that, the South Corridor and West Corridor take the visitor around two more sides of an unseen central courtyard. 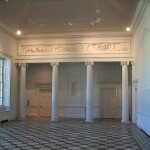 One can look through doorways into various fine rooms. 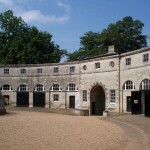 Finally, one is allowed a limited view of the central courtyard, which contains an old tower at the west side, and a large single-storey service building to the north, adjoining the Great Hall. 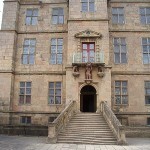 Descending the north-east staircase, one is directed at ground level to the Chinese Drawing Room, with its fine wallpaper and oriel (bay) window, and the double-height Chapel in the tower. 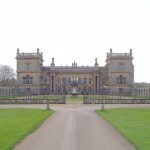 Vanbrugh’s Great Hall, with its superimposed arcades, is at the end of the visitor route. 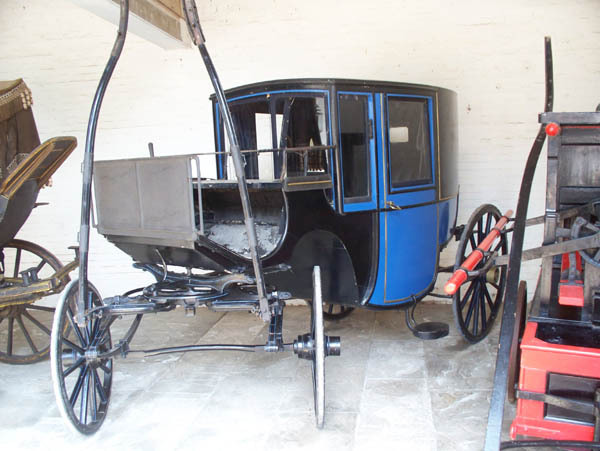 There are many fine objects to look at during the tour, so if you think you did not spend enough time looking, you could go round again. 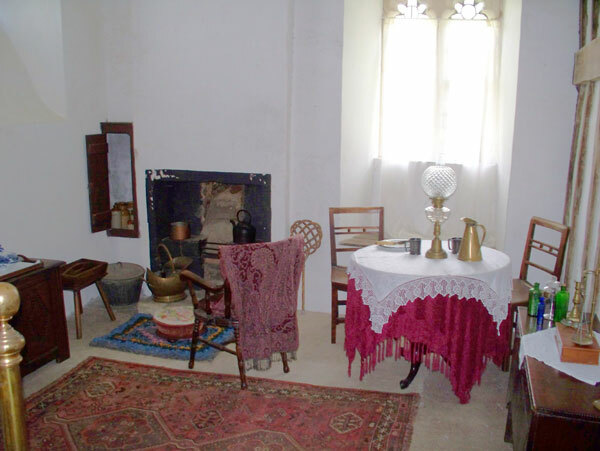 If you go on a self-guiding day (Sunday) you will find helpful room guides in the main rooms and corridors. 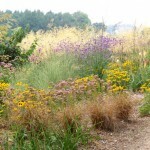 There are two or three things that may affect your enjoyment of the visit. 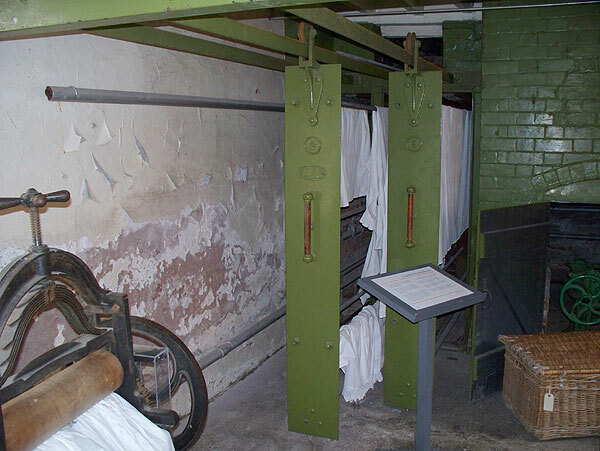 One is that the lighting in some of the rooms is very dim, reportedly to preserve fabrics and materials that are affected by light. 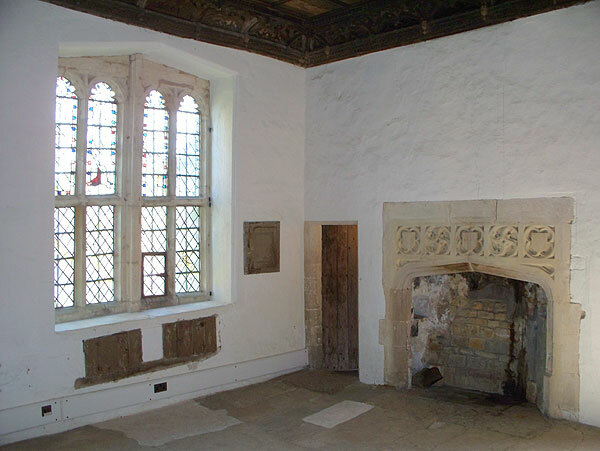 This is common to many great houses, but the lighting in the King James room is so low that it is hard to see some objects clearly. One can not see out of any windows in most rooms. 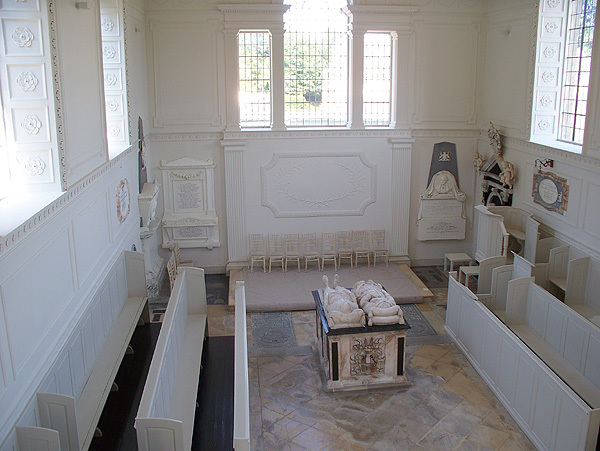 The other is that no floor plan is included in the guidebook. In fact there seems to be no floor plan available anywhere. This is an irritant, since one cannot judge where one is within the building. Also, one cannot see what sections are excluded from the tour. 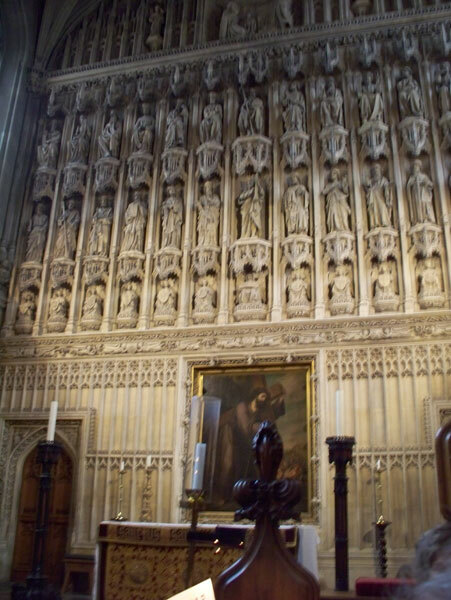 In particular, one cannot judge from inside why the Tapestry Room is narrower than the State Drawing Room, something that a plan would make clear. To remedy the plan deficiency, you can look at the Google Satellite view, which clearly shows the square courtyard and the irregular projections of the East wing and St John’s Tower. 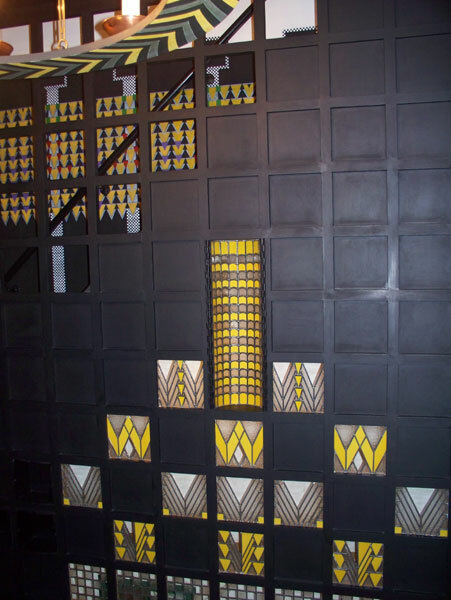 The house at 78 Derngate, Northampton, was transformed by the Glasgow architect Charles Rennie Mackintosh from a modest Victorian terraced house to a building with unique modern designs. The client was W.J. Bassett-Lowke, founder of a prosperous local model-making and engineering business. 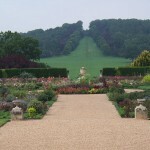 The transformation was carried out in 1916-17. 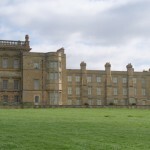 The Bassett-Lowkes moved on nine years later, and the house passed through various hands before the Northampton Borough Council obtained a 999-year lease in 1996. 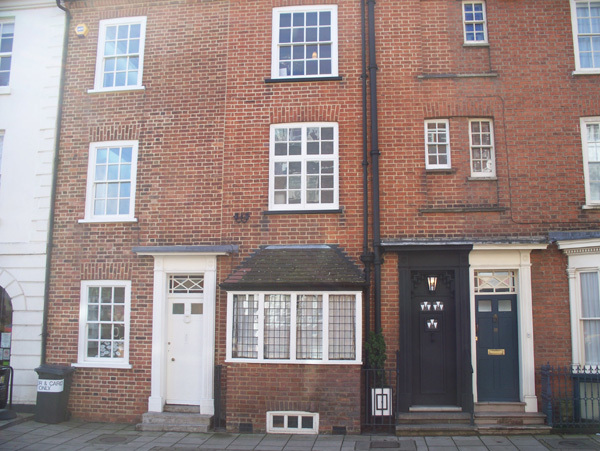 The house was Grade II* listed in 1965. 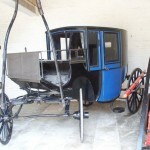 Full restoration was undertaken in 2001. 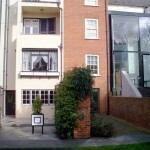 The adjoining house, no 80, was included in the project and stripped out to provide modern access and exhibition space. (In old photos, no 80 appears to have a 2-storey high bay on the front). 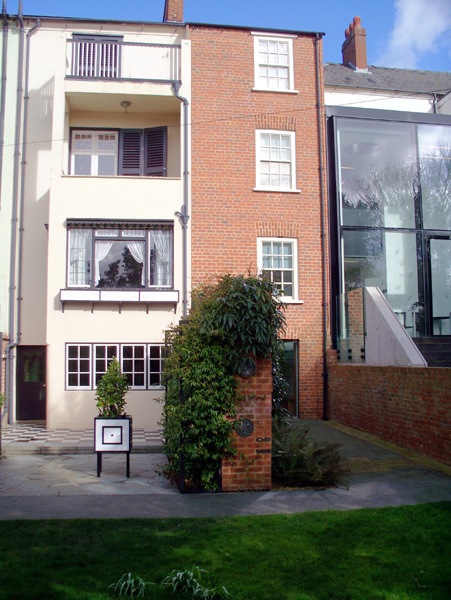 No 82, also now interconnected, contains gallery space and a dining room/cafe. 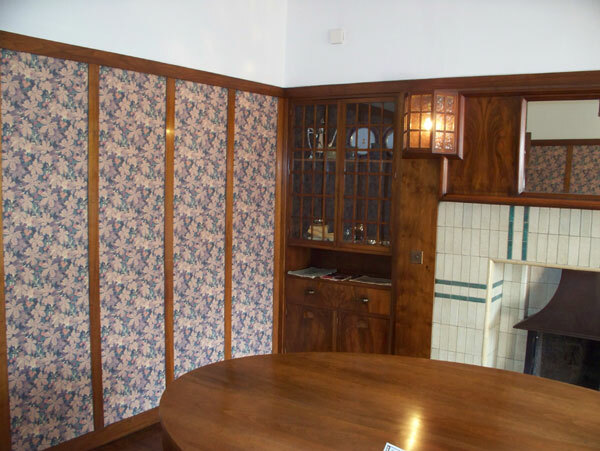 The house was jointly designed by Mackintosh and his client. 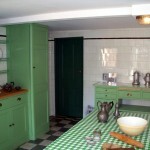 Inside, the basement kitchen was very modern for its day. Upstairs at street level the dining room looks modestly modern, while the hall/lounge looks nearly as bizarre as the photo below suggests. 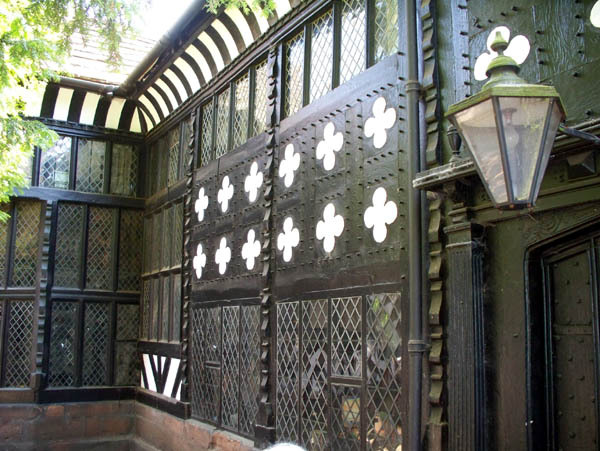 Most surfaces are finished in black, with a coloured frieze applied to the walls, and black furniture. 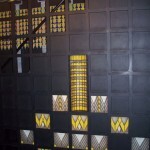 The staircase is turned through 90 deg from its original (and more conventional) position, and is divided off by a lattice screen, also painted black at this level. At first floor level are the principal bedroom and the bathroom. 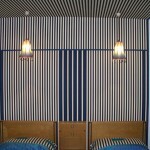 The bedroom is relatively conventional, and has a balcony. 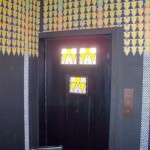 The bathroom was modern in its day and is papered with a washable mosaic design. 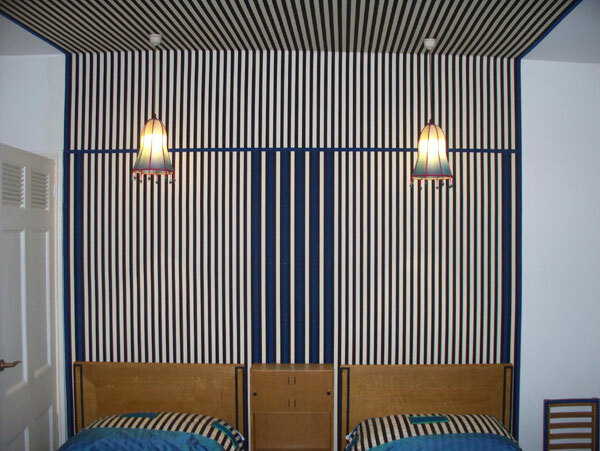 On the second floor are a study, repainted in the original colours, and the guest bedroom, which has a striking fabric backdrop to the twin beds which continues up the ceiling. 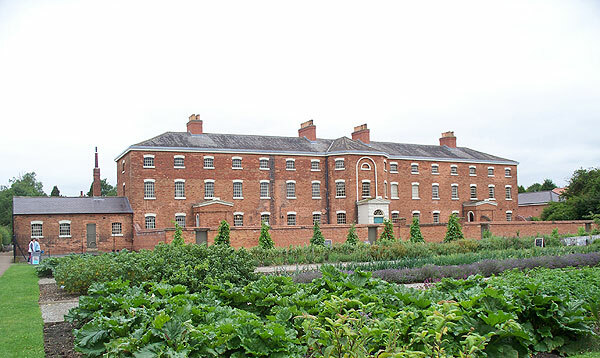 The house has been restored to its 1917 appearance. Some features are original. 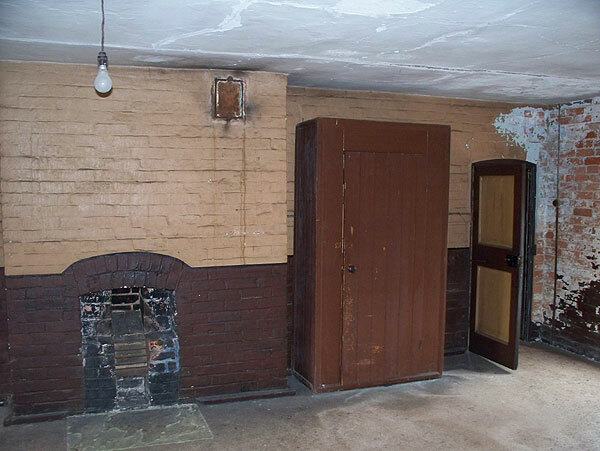 Some of the lost original features are replaced by near-equivalents which differ slightly from the originals, and the installation of furniture (usually replicas) seems to be a work in progress. 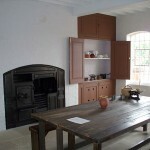 If you are interested in Mackintosh’s work, or modern design, this house is definitely worth a visit. 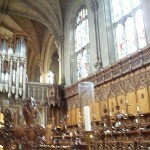 Nearby: The Museum & Art gallery, the Guildhall, and St Peter’s Church. Getting there: there are multi-storey car parks for the Derngate theatres etc. 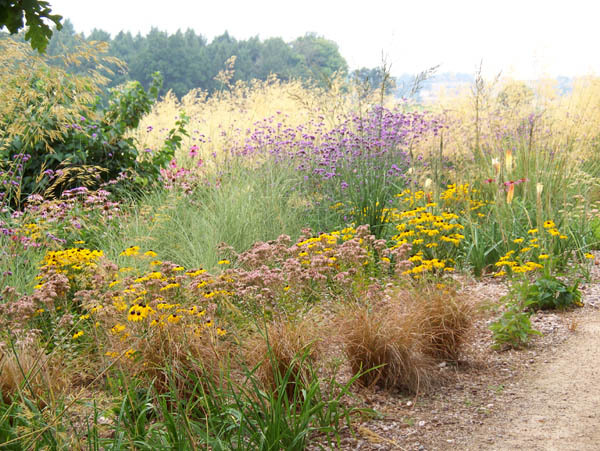 Northampton railway station is a 20 min walk away. 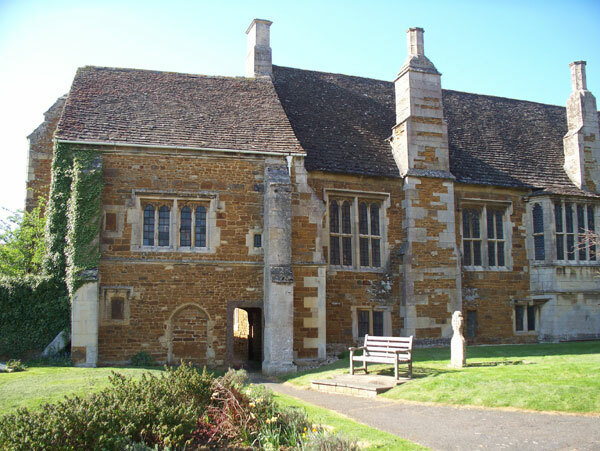 The Throckmorton family have owned Coughton (pronounced ‘coat-on’) since the 1400’s and the present house, with its gatehouse and two wings, dates from the 16th century onwards. The Throckmortons were a Catholic family, and much of their history is a story of persecution, secret worship, and hiding priests. 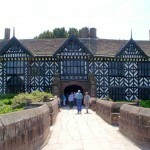 The family were also entangled in the Gunpowder Plot conspiracy. 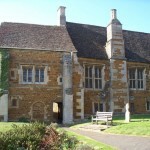 The house, as seen from the courtyard, has two projecting brick and timbered wings in a Tudor-ish style, connected by an imposing stone gatehouse. 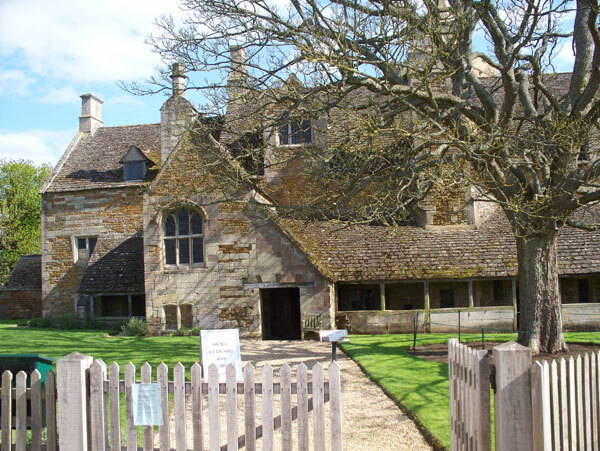 From the other, West, side, the stone gatehouse, flanked by a pair of Gothic styled wings, dominates. 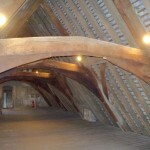 Parts of the gatehouse, including the roof, and most of the South wing are opened to visitors. 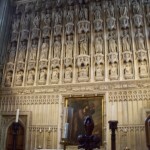 A ‘priests’s hole’ can be seen in the tower. 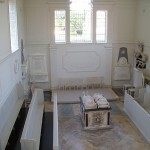 The house contents are interesting, and include some religious relics. 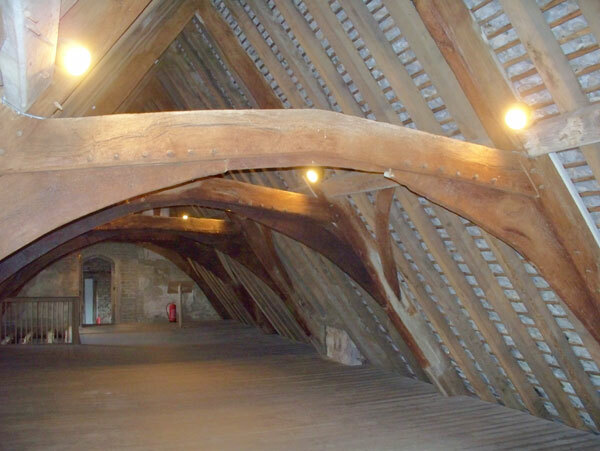 The double-height Saloon is the biggest room, and apparently was the medieval Hall. Looking at the ground-floor South wing plan, it appears that there are some spaces near the end of the tour that are easy to miss. 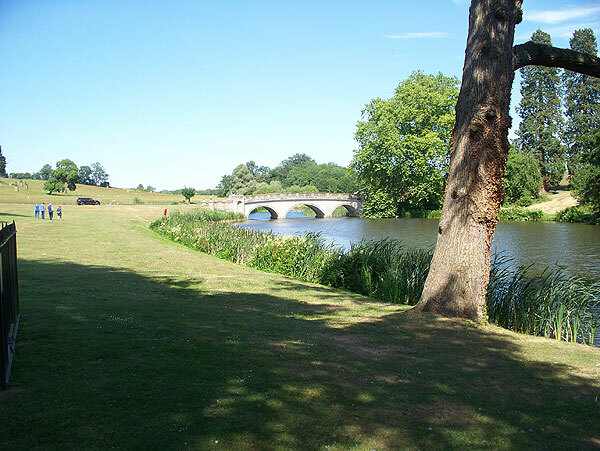 In the grounds, there is no shortage of things for visitors to look at: a walled garden, a lake, river walks, an orchard, two churches, and a vegetable garden. 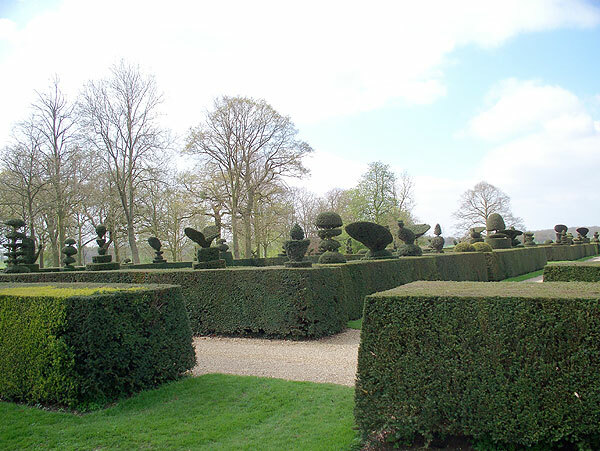 When I visited there were scores of for-sale sculptures dotted around the grounds. 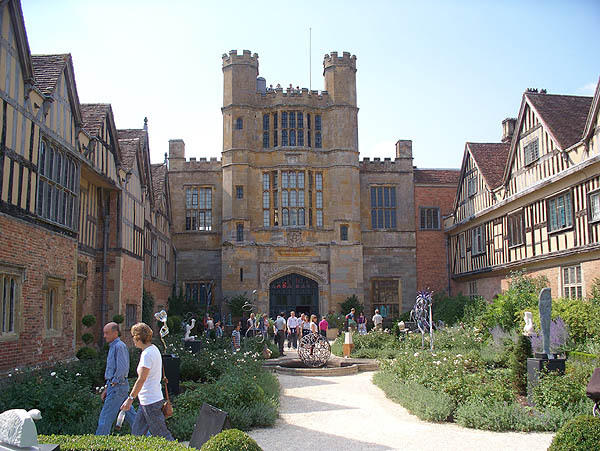 Coughton appears to be a popular destination, and if you want to go around the house it is advisable to go early to avoid being caught out by the timed entry ticketing. 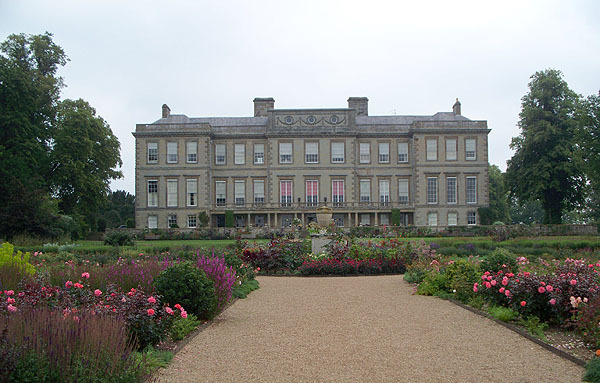 Ragley Hall was built from 1680, but not fully furnished and decorated till the middle of the 18th century. 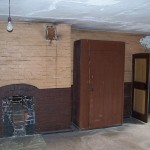 The house and the contents have not been greatly changed in style since then, but extensive restoration had to be carried out after the Second World war, when the house was used as a hospital. 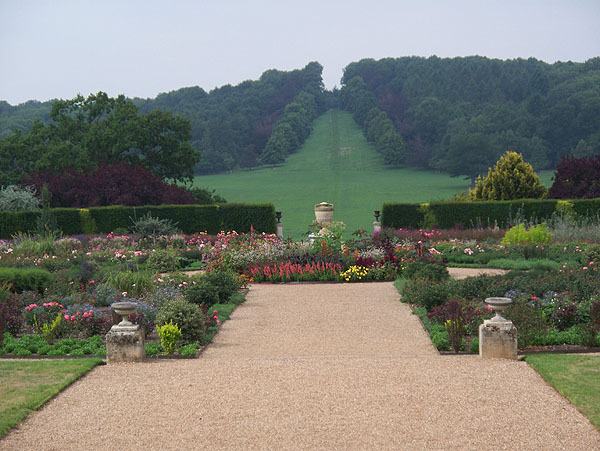 It is still owned by the Seymour family (Marquess of Hertford), who have owned the estate for centuries. 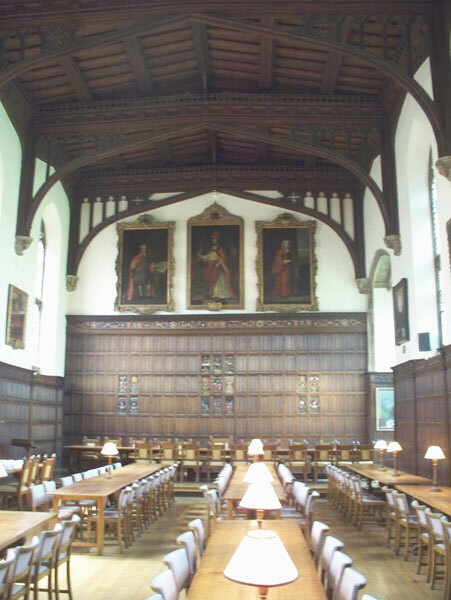 The principal floor contains a number of finely decorated rooms with impressive plasterwork, starting with the double-height Great Hall and continuing through the Music Room, Breakfast Room, Dining Room, Mauve Drawing Room, Red Saloon, Green Drawing Room, and Library. The contents are unremarkable, as all the best stuff went to the Hertford’s house (Wallace Collection) in London. 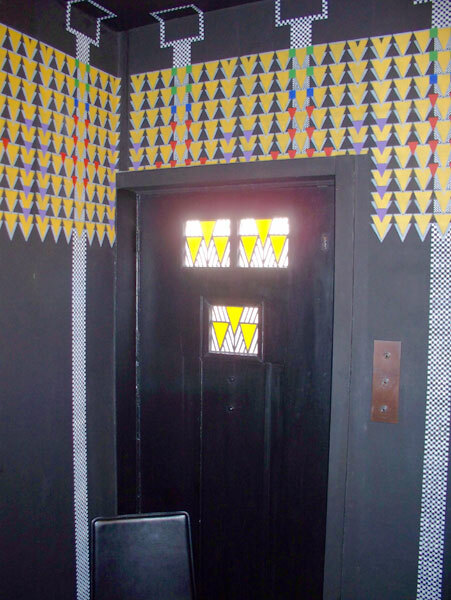 Some touches let you know that you are in a private home, not a National Trust house: a garish modern art canvas hung above the North Staircase Hall, the Prince Regents bed moved to provide a games room for the teenagers, and a vast and colorful modern mural by Graham Rust enlivening the South Staircase Hall. 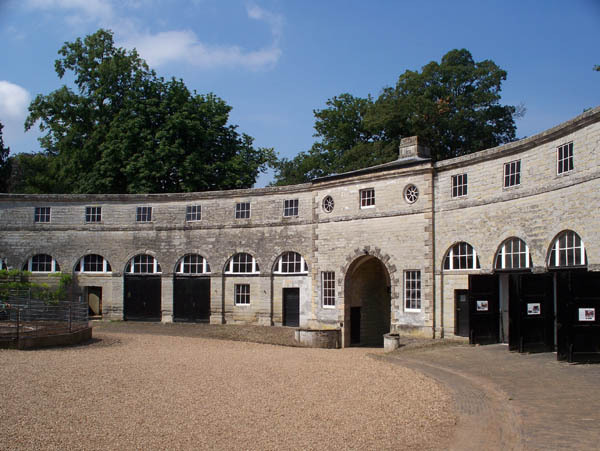 Outside, there are formal gardens near the house, a stable block with an interesting carriage collection, an ice-house, and an extensive park including a lake. Note that the standard admission admits you to the park and grounds only, and you have to pay a further fee at the house, if it’s open. No interior photography was allowed. Click on images to enlarge. 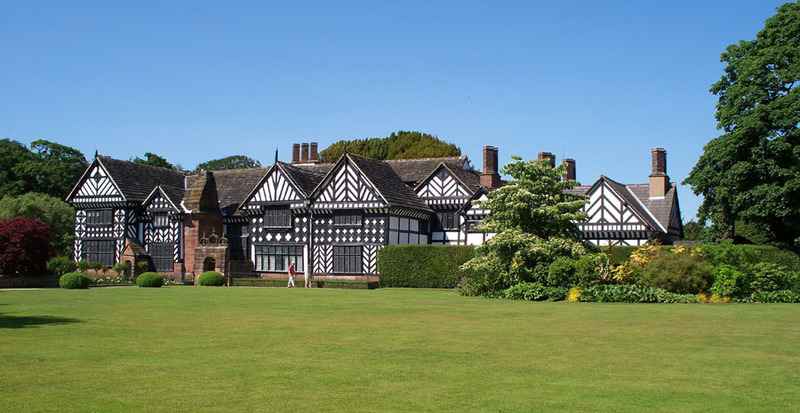 Speke Hall was built in stages during the sixteenth century by the Norris family, and now comprises four timber-framed ranges built around a central courtyard. 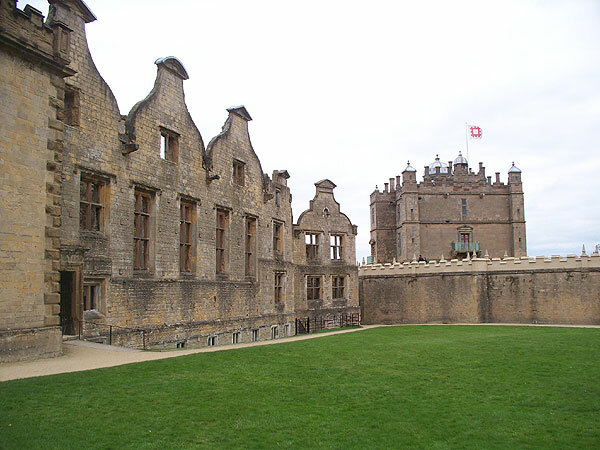 The south-eastern corner with the Great Hall appears to be the earliest part, and the east range, containing the kitchen and scullery, is the latest. 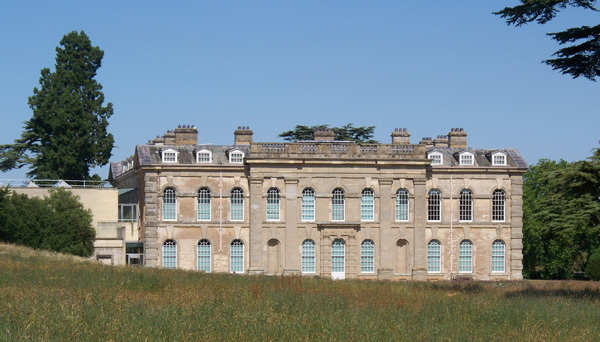 The house later was neglected, and when purchased by Richard Watt in 1795 it appears to have been derelict, with the west wing in complete decay. 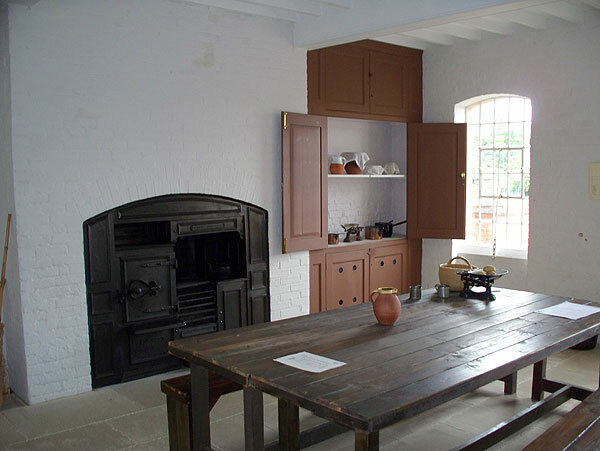 A full restoration was not carried out until the 1850’s, and this gave the interiors their present antiquarian character. 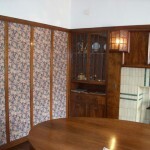 William Morris wallpapers were put up in various rooms. 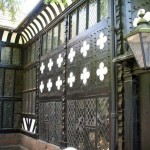 The Tudor-style furniture was mostly introduced in the 19th century. 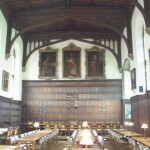 The double-height Great Hall is of irregular shape and contains two fireplaces and elaborate wooden panelling and bay windows. 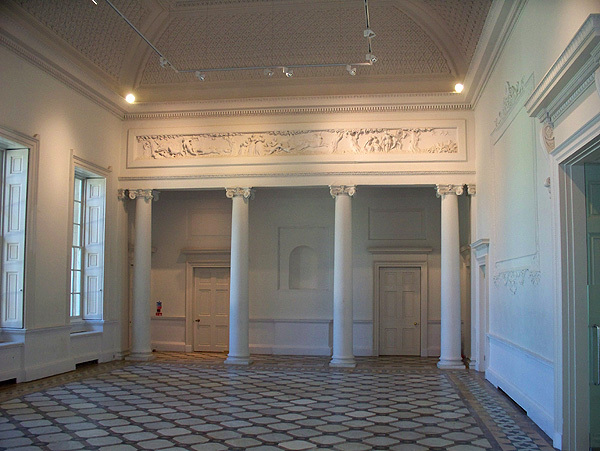 The Great Parlour has an ornate plaster ceiling, and a large fireplace with above it carved wood panels representing William Norris II with his two wives and nineteen children. 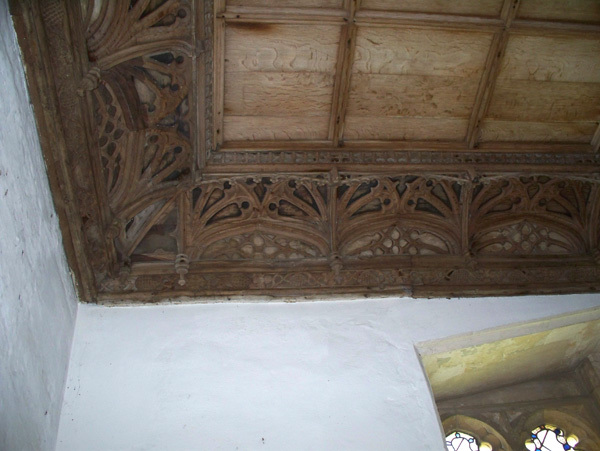 At the other end of the room is a massive oak buffet containing pieces of older carving. 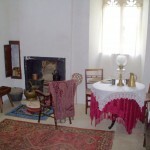 The Blue Drawing Room was fitted out in the 17th century. 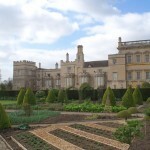 It is presently decorated with William Morris wallpaper, and furnished with a suite of Louis XV style furniture purchased in the 19th century. 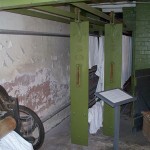 There are several bedrooms on display. 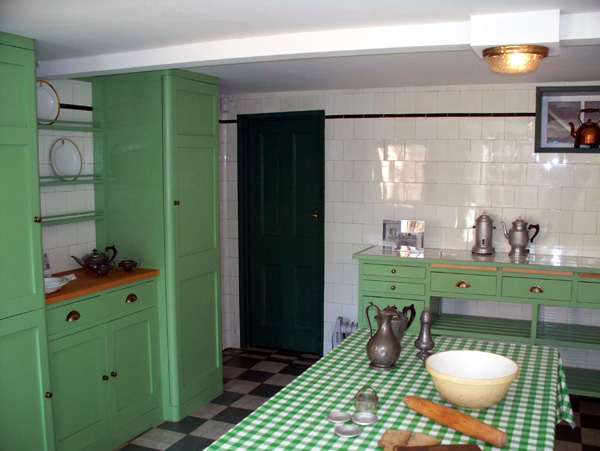 The arrangement of the kitchen and scullery dates from the Victorian renovations of around 1855, and the present cooking range was installed about 1910. 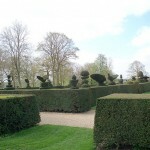 There are formal gardens around the house (mainly behind to the South) and a substantial park with woods, a kitchen garden and orchard, maze and visitor block (formerly a farm).